Free Wi-Fi landscaped grounds and flat-panel TVs make the non-smoking Sheraton La Jolla worth the trip for our guests. The four-story Sheraton is set on seven-and-a-half landscaped acres complete with a pool waterfall and koi pond. All 252 rooms include complimentary Wi-Fi (available throughout the hotel) mini-fridges microwaves coffeemakers and sleek 32-inch flat-panel TVs. There is a full restaurant on-site plus a lounge that offers lighter fare. Room service is available for guests who'd prefer a quiet night in. Fitness buffs are happy to hear that the workout room is open 24 hours a day. Parking is available for a fee. The Sheraton is located four miles from the village of La Jolla and steps from the University of California San Diego. You'll find several restaurants two movie theaters a supermarket and shopping center within easy walking distance. The acclaimed La Jolla Playhouse is less than one mile away. A number of golf courses are accessible within a 10-minute drive. 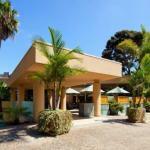 The hotel is a 20-minute drive from San Diego and 13 miles from San Diego International Airport.